day, as a chunky knit and soft scarf are my go to winter pieces! Here are a few styles and some inspiration I’m loving this season…. I always tend to size up when buying cardigans as I love the oversized look! 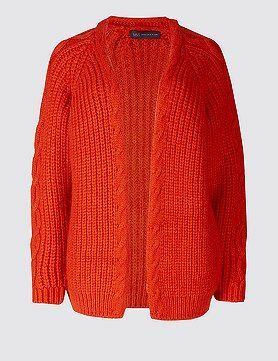 A beautiful spiced orange knit from Marks&Spencer…. A simple plain tee or fine merino polo knit and cashmere scarf would look amazing with this! As a basic winter wardrobe staple,you can’t beat an oversized black polo knit. Wear it dressed up up as an all black outfit with leather boots….so classy!! On more laid back days pair with your favourite jeans for a casual option. Penneys and Dunnes are always good for basic chunky knits. Hope you get a little inspiration here to start the winter layering!